To celebrate the UK cinema release of 'Benny & Jolene', Los Campesinos! are giving away a song they wrote for the film's soundtrack, 'Little Mouth'. It's not a new track, per se, having been recorded prior to the band's most recent album, 2013's 'No Blues' - but more importantly, it's an enjoyably breezy number. When I say breezy, I do mean in more of a melodically evocative manner, especially with Kim taking more of a front seat vocally than de facto frontman Gareth. The lyrics have more of a longing, yearning aspect to them - "I feel such a long way from you". Download the track below, and watch the video to previous single 'Avocado Baby', directed by 'Benny & Jolene'/'Submarine' actor Craig Roberts. 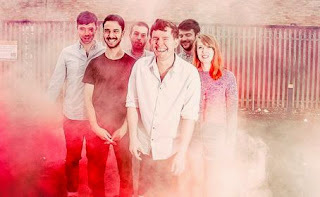 Find more info at loscampesinos.com.